Studying some Bible characters will help us to avoid their mistakes and the traps into which they fell. Cain, Esau, Samson and Saul and others all made foolish and tragic mistakes. Because they failed to follow God singleheartedly they lost health, position, power, literally everything. There is a man in the Old Testament who possessed tremendous gifts and potential. However, both Old and New Testaments record the sad history of a prophet who became a soothsayer, or more plainly, a witch. His name is Balaam (II Peter 2:15). Scripture says that God forbade the madness of the prophet. Balaam is not said to be a false, but a true prophet who became mentally and spiritually deranged. He started out in the Spirit of the Lord with great miracles and manifestations of God. Through a series of wrong choices he became a false prophet, a soothsayer or fortune teller, dabbling in witchcraft. This led to disgrace and being put to death by the children of Israel with the sword (Joshua 13:22). He is labeled as Balaam the soothsayer (defined as: a man who has the spirit of divination; a fortune teller, a man who can divine the future). In a matter of months Balaam completely ceased being a prophet of the Lord and became a soothsayer, worthy of death. What caused this to happen should be a serious warning to all who have entered the Charismatic movement. Be warned that anyone who enters the realm of the spirit world is in serious danger unless he walks the straight and narrow path all the way. There is safety only in strict obedience to the Lord and His Word. Three entire chapters in Numbers tell the story of Balaam (Numbers 22,23,24), indicating the importance of this account in the sight of God. These should be read and reread, studied and analyzed. In these passages are certain truths about the means God uses to keep us from falling into the enemy’s trap. To be forewarned is to be forearmed. Consider some of the signs of a true prophet which appeared and developed in Balaam’s life. In Numbers 22:6 the word of Balaam was so powerful that God confirmed and corroborated it. Everything that Balaam said came to pass. If he cursed, God cursed; if he blessed, God blessed. His word carried power. One of the signs of a true prophet is that God backs his word in every detail. God indeed confirms the word and performs the counsel for those He has called and appointed to certain specific ministries (Isaiah 44:26). Balaam was also visited by the Lord and God frequently spoke to him. It was not something which occurred only once or twice in his lifetime. “And he said unto them, `Lodge here this night, and I will bring you word again, as the Lord shall speak unto me’; and the princes of Moab abode with Balaam. Notice God also spoke to him giving directions and guidance. Constant communication between the prophet and God is another mark of a prophet. In the Old Testament, God often appeared to certain ones communing with them. 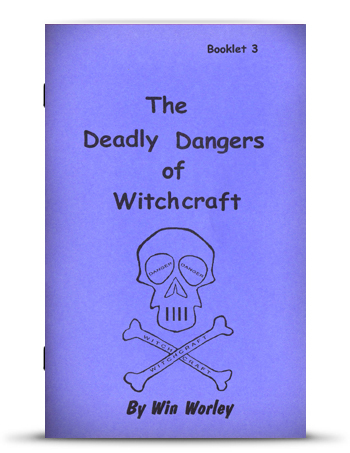 The following is an excerpt from “The Deadly Dangers of Witchcraft, Booklet #3″ by Pastor Win Worley. Copyright © 1980 by Win Worley, Revised © 1991. All rights reserved. No part of this publication may be reproduced or transmitted in any form or by any means, electronic or mechanical, including storage and retrieval system, without securing permission in writing from the publisher, WRW Publications, PO BOX 9309, Highland, IN 46322.